Stand-up comics call it a "tough crowd," but then tough crowds are part of their business. It's a whole other matter to be met with cold stares when you are the President of the United States, talking in prime time before a joint session of Congress, when your party controls both chambers by historic margins. President Obama spoke the first 676 words of his State of the Union address on Wednesday night before the first hand clap. His tone was so somber, and the room's mood so grave, that no one moved when Obama said, "We must answer history's call." There were no ovations when he called for "Democrats and Republicans to work through our differences, to overcome the numbing weight of our problems." He got no love for saying, "The worst of the storm has passed." By the time he announced that "we cut taxes for 8 million Americans paying for college," Obama was forced to go off script. "I thought I'd get some applause on that one," he said, looking over to the Republicans, who were sitting on their hands. There was some giggling, and some of them relented, offering the congressional version of a golf clap. So it went all night for the President, who a year ago came before the same body to announce, "Now is the time to act boldly and wisely." That bold wisdom has, in the course of a year, been transformed into a much more qualified vision of something short of significant legislative failure. "To Democrats, I would remind you that we still have the largest majority in decades, and the people expect us to solve some problems, not run for the hills," he said. While the Democrats at times seemed to be considering the exits, the Republicans in the crowd handled the event with a renewed sense of confidence. A few minutes before Obama arrived, Republican Representative Mike Pence, standing in Statuary Hall, explained that he had turned down a chance to run for the Senate so he could help lead Republicans back to power in the House. "This is a genuine, authentic, American movement," he said of the political winds that had won Republicans statewide races in New Jersey, Massachusetts and Virginia. Inside the chamber, the GOP did away with the pranks and gimmicks they displayed the last time Obama addressed a joint session. Eschewing paper signs or rude interruptions, they seemed content to pass the time with the sort of cool confidence that accompanies a sense of ascendancy. House minority leader John Boehner, bronzed and cocky, kept making faces and spreading his hands in disbelief at Obama's applause lines. When Obama spoke about creating jobs for small business, Boehner spread his hands and cocked his head as if to say, "So now you're getting it." When Obama congratulated himself for not raising income taxes by "a single dime," Boehner looked incredulous  as if to say, "Really, he wants credit for that?" When Obama asked "if anyone from either party has a better approach" to health care reform, Boehner shot out of his seat and raised his hand. He was not called on. On policy, the President recommitted himself to health care reform, though he did not lay out a strategy for passage. He gave glancing mentions to both repealing the ban on gays in the military and confronting immigration reform but offered no clear hope for resolving those issues. He was fiercely critical of the Supreme Court's recent ruling to allow corporate and union contributions to political campaigns, earning himself a disapproving head shake from Justice Samuel Alito, who sat in his robe in the second row. 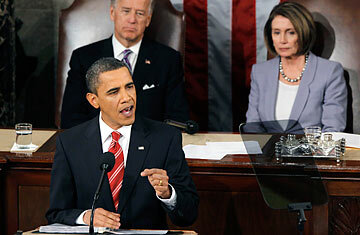 Obama also spoke at length about the deficit, saying he would freeze government spending, but not until next year. When some Republicans snickered at the delay, suggesting through their derision that the President was not as serious as he claimed to be, Obama shot them a quick rejoinder. "That's how budgeting works," he pointed out, quite accurately. Although it was his first official State of the Union address, it was the third time that Obama had addressed a joint session of Congress in prime time. The first, in February 2009, was an introduction, a statement of goals and principles. The second, in September, was a defensive play, an attempt to reclaim the high ground on health care, which had begun to slip away. This third time was a declaration of his having survived his first serious setback and of his determination to keep trying. "Our Administration has had some political setbacks this year, and some of them were deserved," he said. "But I wake up every day knowing that they are nothing compared to the setbacks that families all across this country have faced this year." Once again, in response, the chamber before him declined to offer a round of applause. See the State of the Union Address in 3 Minutes.